After detective Natsumi Yukihira (Ryoko Shinohara) brings an end to the police hospital terrorist case (storyline took place in "Unfair: The Movie"), Natsumi is transferred to the Nishimonbetsu Police Station in Hokkaido. Meanwhile, a series of grotesque murders occurs in downtown Tokyo involving nails placed in the body of the victims. The fingerprint of Natsumi's ex-husband, freelancer journalist Kazuo Sato (Teruyuki Kagawa), is found on the the body of a victim and Kazuo is placed on the most wanted list. Soon after, Kazuo finds Natsumi and hands her a USB memory stick. The device contains information on a secret organization within the police department. Kazuo tells Natsumi that the series of murders are warnings and suspects become the next victims. Natsumi is then arrested as a suspect. 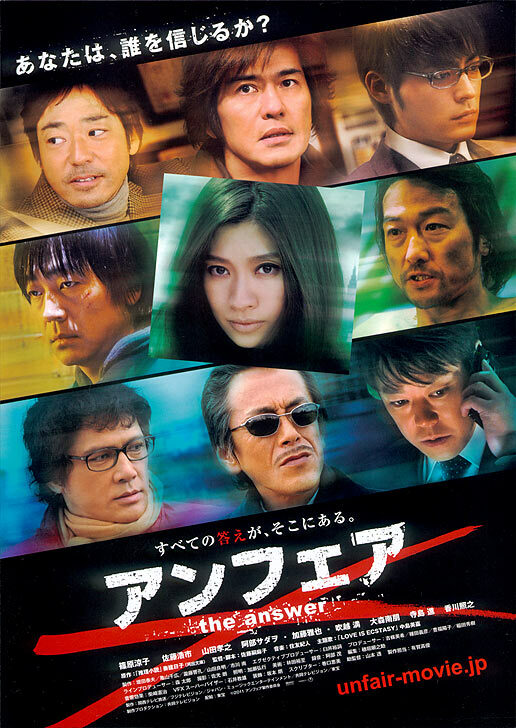 Tokyo prosecutor Katsuaki Murakami (Takayuki Yamada) appears at the Nishimonbetsu Police Station to investigate. Based on novel “Suiri Shosetsu” by Takehiko Hata (published December 20, 2004 by Kawade Shobo Shinsha Publishers inc.). rokujo Jul 26 2011 10:56 pm really long wait from last movie. hope this really the real answer.